Good morning. It is my great honour to join you all today. 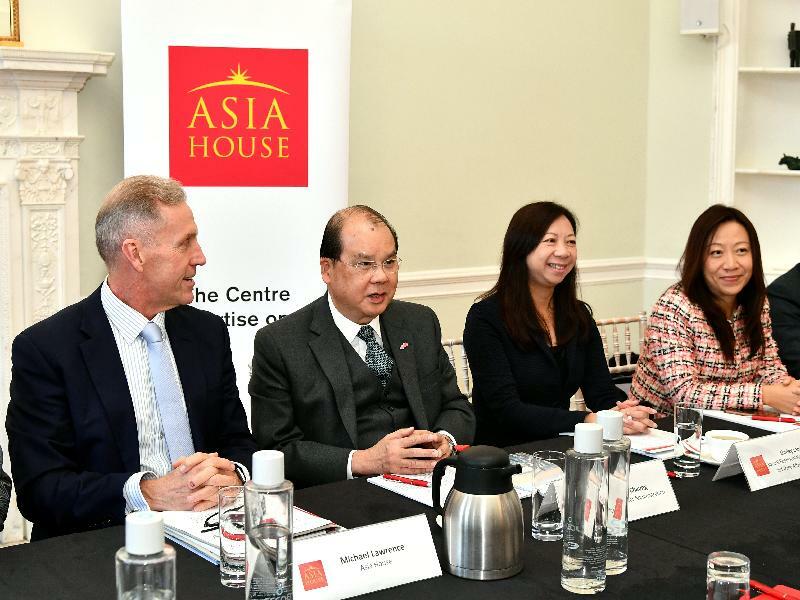 Hong Kong values our friendship with Asia House, a friendship that provides important opportunities for insightful sharing on a wide variety of topics. Last September, Asia House staged its Signature Conference in Hong Kong for the first time, and I am pleased to be back here today for the return fixture, so to speak. When the current-term Government of the Hong Kong Special Administrative Region (HKSAR) took office last year on July 1, the Chief Executive, Mrs Carrie Lam, set out her new approach to governance, specifically, to expand the Government's role beyond that of the conventional and time-honoured "regulator" and "service provider" to include the roles of the dynamic and proactive "facilitator" and "promoter". But this major change is taking place within the parameters of our free-enterprise and business friendly economy. In fact, this metamorphosis adds to the flexibility and attractions of Hong Kong as the freest economy in the world for 24 consecutive years in a row. To kickoff this roundtable discussion, I would like to talk about some of the ways that this new approach is being implemented. I will also share with you some of the results that we have achieved, guided by the principle of being more "innovative", "interactive" and "collaborative". Firstly, innovative. Over the past 15 months, we have been testing new ways to better engage the public, especially our younger generation, some of whom somehow feel left behind in the city's development or excluded from being involved in public policy-making. We need to find innovative ways to connect with our young people. For they represent our hope and the future of our city. We cannot afford to leave anyone behind. Indeed, every single youth counts! To this end, we have taken a fresh approach in encouraging more young people to engage in public affairs. A shining example is the introduction of the first-ever "Be a Government Official for a Day" programme to provide senior secondary students with the opportunities to "job shadow" designated top government officials for a day during the summer vacation. All the three Secretaries and 13 Bureau Directors took part in the programme and shared with students their work experience while learning from students the views and suggestions of the younger generation on different policy issues and Hong Kong's future development. The programme can also help inspire students to develop positive values, adopt multi-perspective thinking, strive to realise their potential in full and seize opportunities for upward mobility. Turning to innovation and technology (I&T) which will be a key driver for social and economic development locally, nationally and internationally for many years to come, I note with great interest that Asia House hosted a roundtable just yesterday entitled "China's growing quest for technology innovation". Hong Kong has a key role to play in our country's innovation and technology development –not least through our deep pool of local and international I&T talent and world-class hardware including the Hong Kong Science Park and Cyberport. To keep pace with global trends and capture I&T opportunities, the HKSAR Government is investing boldly in I&T initiatives. We have set a goal to double the Gross Domestic Expenditure on R&D as a percentage of the Gross Domestic Product to about HK$45billion a year (i.e. from 0.73 per cent to 1.5 per cent) by the end of the current Government's five-year term of office in 2022. Further to the $10billion announced in 2017 Budget, we further announced in this year's Budget another HK$50billion for I&T development in Hong Kong. This includes HK$20billion for the first phase of development of the Hong Kong-Shenzhen Innovation and Technology Park located at the boundary between Hong Kong and Shenzhen. Other related incentives include additional tax deduction for expenditure incurred by enterprises on research and development to encourage them to invest in innovation and technology. The first HK$2 million eligible research and development expenditure will enjoy a 300 per cent tax deduction and 200 per cent for the remainder. We have also launched a HK$500 million Technology Talent Scheme just last month (August 2018) to recruit talent from outside Hong Kong to carry out research and development activities and train their local staff to apply cutting-edge technology for adding value to their businesses. The "Postdoctoral Hub" founded under the Scheme provides funding support for enterprises to recruit postdoctoral talent for scientific research and product development. The Scheme will also fund local companies on a 2 to 1 matching basis to train their staff in high-end technologies, especially those related to Industry 4.0 through its Reindustrialisation and Technology Training Programme. In parallel, we launched the Talent List last month (August 28) to draw in high quality talents from all over the world in respect of 11 specified professions, including Fintech professionals and Innovation and Technology experts under the Quality Migrant Admission Scheme to support Hong Kong's development as a "high value-added and diversified economy". To address the healthcare services demand arising from the growing ageing population, we also aim to attract more qualified medical professionals to Hong Kong. In particular, we want to entice Hong Kong people who have studied medicine overseas, including many of them in the United Kingdom (UK) to return home after their studies and work in Hong Kong in anticipation of a strong demand for medical professionals in our public hospitals as the Hospital Authority rolls out the first ten-year Hospital Development Plan (HDP) amounting to HK$200 billion investment to facilitate timely commencement, progression and completion for major hospital development projects for meeting future service needs. In fact, our huge and ever increasing demand for health services, in both hardware and software, open up vast services and career opportunities for UK firms and institutions. Notably, the first ten-year HDP will provide around 5 000 additional bed spaces through development of new hospitals or redevelopment/expansion of some existing ones. In the light of an increasing demand for healthcare services, the HKSAR Government has invited the Hospital Authority to start planning the second ten-year HDP. A sum of HK$300 billion has been earmarked as an initial provision to support the second ten-year HDP, improve the clinic facilities in the Department of Health, and upgrade and increase healthcare teaching facilities. Of course, we welcome medical talents from the UK and elsewhere to work in Hong Kong too! In fact, we are making Hong Kong a more attractive place for non-locally trained doctors keen to work in. We recently extended the validity period and renewal period of limited registration from not exceeding one year to not exceeding three years in order to offer a more predictable and prosperous career development opportunities for overseas medical professionals in Hong Kong. One of my missions to London this week is to meet and appeal to medical professionals here to work in Hong Kong. We expect that we need at least an extra of 1 000 full-time equivalent doctors by year 2030 based on the existing level of services. Attracting quality overseas talents to Hong Kong not only fills a talent void in specific sectors, it also helps our home-grown talent to raise their game. They can learn a great deal by working alongside experienced professionals from different countries, cultures and backgrounds. So it is a win-win scenario. In return, our overseas talents will be exposed to new ventures and widen their network in Asia. Just last month, the HKSAR Government launched our first Talent List to target overseas talent from 11 specific professions to come to Hong Kong and contribute to our economic development. Professional sectors included in the List range from finance, biotechnology to engineering and creative industries. We have also launched a HK$500 million Technology Talent Scheme last month. One of the initiatives set up under the Scheme is to establish a "Postdoctoral Hub" to provide funding support for enterprises to recruit postdoctoral talent for scientific research and product development. Another initiative, namely the Reindustrialisation and Technology Training Programme, will fund local companies on a 2 to 1 matching basis to train their staff in high-end technologies, especially those related to Industry 4.0. I have mentioned some of our innovative approaches to governance; turning now to the principle of being "interactive". Let me be clear: the HKSAR Government is not planning to interfere in Hong Kong's famously free and open economy. Rather, we see areas where the Government can be more proactive in facilitating and promoting opportunities. A good example of this is a new "Space Sharing Scheme for Youth". This is a tripartite collaboration among the business sector, NGOs and the Government to provide co-working space for young entrepreneurs at concessionary rental (not more than two-thirds of market rent). So far, 10 developers have offered more than 100 000square feet of space for the scheme. The HKSAR Government does not take part in the operation of tenancy arrangements. Instead, our facilitator role helps to match participants from the business community with the operating organisations, mostly NGOs. This new form of cross-sectoral collaboration has achieved positive results and good feedback from stakeholders and the community at large. We are also taking a more interactive approach to resolving big issues in Hong Kong. We have also taken a fresh approach in encouraging more young people to engage in public affairs. The launch of the "Member Self-recommendation Scheme for Youth" which aims to enable young people to directly participate in policy formulation is a case in point. By appointing more young people aged 18 to 35 to specified government advisory boards and committees, we can better understand their views and address their concerns. In a number of areas, we have formed expert groups and commissions to tap into the city's deep pool of expertise and experience. Amongst those that I chair are the Youth Development Commission, the Commission on Children and the Human Resources Planning Commission. They all have members drawn from the relevant sectors and young people selected from the Self-recommendation Scheme. The target is to increase the overall ratio of youth members on government boards and committees from the current 8.6 per cent to 15 per cent within the duration of the current-term Government. Our third guiding principle is "collaborative". We are joining hands with stakeholders in the private sector to nurture career paths and create opportunities. We provide an average of more than 70 000 annual places for our young people to participate in exchange and internship programmes on Mainland China and overseas including Guangdong-Hong Kong-Macao Greater Bay Area and the Belt and Road countries. In addition, the HKSAR Government launched a new Pilot Corporate Internship Scheme this summer in collaboration with major Hong Kong companies. The Scheme provides quality internship places for local tertiary students on the Mainland and overseas. The response has been very encouraging. 16 major participating corporations offer a total of around 250 internship places, distributed across various Mainland provinces and cities as well as seven overseas countries, including Thailand, Vietnam, Malaysia, Singapore, Indonesia, Australia and the UK. These internships give participants valuable chances to expand their horizons. Not only do the interns get a taste of life in the workplace, they also gain fuller understanding of how their career paths can align with the bigger picture of regional and global growth opportunities, thereby contributing to the diverse development of Hong Kong. Indeed, cross-boundary connectivity is a timely topic for the long-term prosperity of Hong Kong and our future generations. Infrastructure-wise, the 22-kilometre Hong Kong Section of the Guangzhou-Shenzhen-Hong Kong Express Rail Link has just come on stream on September 23, plugging Hong Kong into the over 25000-kilometre national high-speed rail grid in our Motherland. Meanwhile, the mega 42-kilometre long Hong Kong-Zhuhai-Macao Bridge, one of the longest bridges above water in the world, is about to commence operation, opening up new markets in the Pearl River Delta region. We can expect these large-scale infrastructure developments to bring significant economic opportunities to Hong Kong, notably in the tourism, logistics, professional services sectors and more. The Bridge and Express Rail Link will also help secure Hong Kong's position as a bridgehead economy for the many ventures led by the Greater Bay Area and along Belt and Road corridors. Indeed, the Belt and Road Initiative is a core element of our business collaboration strategy with the UK. Amongst other things, the Belt and Road is mentioned in the Joint Statement on Closer Collaboration between UK and Hong Kong on Trade and Economic Matters announced in March this year. The Joint Statement pays tribute to the strong and well-established relations between the UK and Hong Kong, and it identifies priority areas for deeper and broader collaboration such as innovation and technology and smart city development. Ladies and gentlemen, Hong Kong, as always, continues to be a fast-paced and rapidly evolving city. The HKSAR Government also responds to changes swiftly, tackles challenges unyieldingly, addresses public concerns compassionately and creates opportunities for economic and social development tirelessly. The positive responses from the general public in the past 13 months have proven that this term of HKSAR Government is on the right track under the principles of "innovative", "interactive" and "collaborative" governance. But there is no room for complacency. There is a long road ahead and we look forward to hearing your views on the possible way that we may explore to deepen the bilateral ties between Hong Kong and the UK to continue to flourish. On this encouraging note, I would like to thank all of you again for being here today. We are grateful to you all for sharing your valuable time and expertise with us during this roundtable. So, without further ado, let me hand back to Michael.